How the U.S. must respond to the North Korean nuclear threat. China Won’t Stop Kim Jong-un. The U.S. Must Stand Up to Both of Them. Sanctions won’t work. We can’t destroy his nukes. We can rattle a few sabers, however. 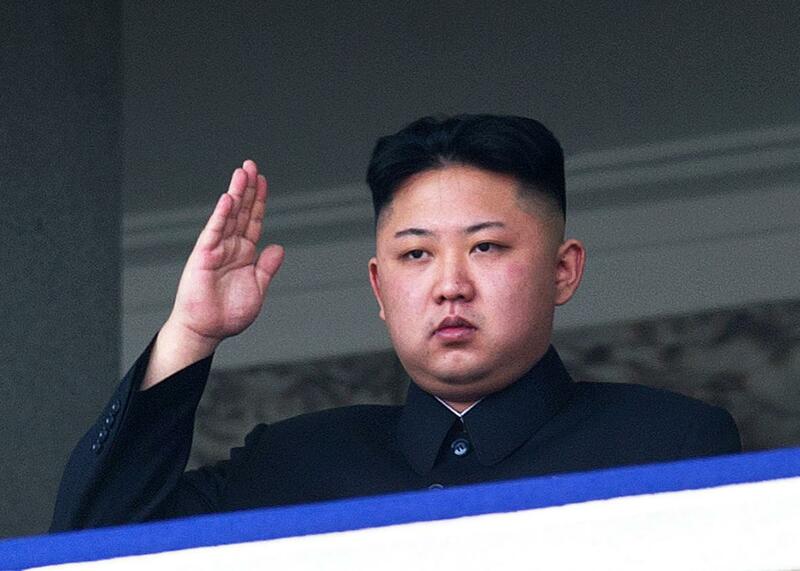 North Korean leader Kim Jong-un, above in Pyongyang in 2012, may be overplaying his hand. What to do with the pygmy of Pyongyang, the mad marshal of the Hermit Kingdom, by which I mean Kim Jong-un, the thirtysomething tyrant of North Korea? On Sept. 9, his scientists set off their country’s fifth nuclear test, but there were two differences this time. First, the explosion was considerably larger (10 to 20 kilotons, roughly the size of the Hiroshima blast). Second, and more concerning, the bomb was described not as a “nuclear device” but a “nuclear warhead”—suggesting that they’re now able to miniaturize a weapon, so it can be placed in the nose cone of a missile. If this is true, North Korea can claim to be very close to what President Obama said he would never allow it to become—a nuclear-weapons state. It wouldn’t be a very powerful one, possessing the materials for maybe a dozen small A-bombs (even the recent test released one-tenth the blast of the smallest U.S. warhead), but any nuclear weapon holds the stuff of enormous terror, especially in the hands of such a cloistered regime and such an unpredictable leader. So what to do? The temptation, of course, is to blow it all up—but Kim’s scientists have learned the lessons of previous preemptive strikes and dispersed their facilities, some of them deep underground. Another possibility is to tighten sanctions—but North Korea is already so isolated, further strictures aren’t likely to affect Kim’s behavior, at least as long as oil, gas, and the elite’s luxury goods are let in through the Chinese border. How about coaxing China to do something? Four American presidents have tried, to little avail (for reasons to be elaborated below). Reopening nuclear arms talks? This approach worked for a while in the 1990s with Kim’s father and grandfather, Kim Jong-il and Kim Il-sung. Shrewd U.S. diplomats figured out the formula for dealing with the “Dear Leader” and “Great Leader,” as they were called. But the new, much younger Kim is a very different, more brutal figure who doesn’t play by his elders’—or, it seems, anyone else’s—rulebook. But Bush had no ideas for how to defeat this particular evil (it turned out that brandishing some bombers and scowling had no effect), so the North Koreans continued to enrich uranium, resumed their plutonium program, and, in July 2003, announced that they’d reprocessed all 8,000 fuel rods, enough to build a half-dozen bombs. At that point, Bush tried to get talks going on again, but it was too late. In 2006, the North Koreans set off their first atomic explosion, figuring if they couldn’t bargain away their nuclear materials, they might as well go ahead and build some weapons. North Korea wants a nuclear arsenal for the same reason some other countries, especially smaller countries, would like to have one—to deter an attack by enemies. North Korea genuinely fears an American invasion and always has. The Kim dynasty has amassed its power, and oppressed its own people, by hyping this fear. From the regime’s beginnings just after World War II, its leaders have regarded their nation as a “shrimp among whales” whose survival relies on playing the bigger powers off one another. The first two Kims played this game very shrewdly. The latest scion, Kim Jong-un, may be overplaying his hand—but his comeuppance may take a while to materialize. Chinese President Xi Jinping is clearly annoyed with the whippersnapper—he has pointedly never met with him (despite their nations’ status as allies), though he’s held many substantive sessions with Park Gyen-hye, the U.S.-allied South Korean president (and thus the devil incarnate in Kim’s mind). Xi has also voted in favor of U.N. Security Council resolutions condemning North Korea’s nuclear tests and has even condoned multinational maritime raids on ships carrying nuclear materials in and out of North Korean harbors. But, much as Presidents Park and Obama have urged Xi to take real action against North Korea, this isn’t likely to happen anytime soon. If Xi did take action, that would be the end of the crisis. Nearly all of North Korea’s imports come through China’s borders, and Chinese banks handle financial transactions of the country’s elite. If Xi shut down the traffic until Kim dismantled his nuclear program, Kim would have to comply. Xi leaves Kim alone on this score for three reasons. First, this sort of pressure would cripple and possibly implode Kim’s regime, siring chaos, prompting tens of millions of North Koreans to flee across China’s remote northeastern border, creating a humanitarian disaster that Beijing couldn’t readily solve. Second, an allied North Korea serves as an impassible buffer to the U.S. military. If Kim’s regime fell, the entire Korean peninsula would come under South Korean control, and the buffer would be erased; the U.S. military would straddle China’s border. Or, another possibility: With the vanishing of a threat from Pyongyang, the U.S. military in Asia could redeploy to strengthen defenses in the Taiwan straits and the South China Sea, obstructing Beijing’s expansionist interests there. And so, as much as Xi regards North Korea’s fledgling nuclear capability as a danger to the region’s stability, it’s not a threat to China directly, and the alternatives—all of which lead to the crumbling of the North Korean state—are seen as more damaging still to his own strategic interests. In a statement on Monday, China’s foreign ministry said that the United States would have to take responsibility for the North Korean crisis. This evasive stance is precisely what President Obama (or, given the short time left in his term, his successor) has to change. The North Korea nuclear problem is China’s problem: China alone is enabling it by keeping Kim’s regime well-stocked and thus protecting it from economic catastrophe; China alone could solve it by threatening to withdraw support. So the United States should rally the same sort of campaign that revved up the pressure against Iran before those nuclear talks got underway. In other words, the international community should apply sanctions not only against North Korea but also against all institutions that do business with North Korea—an action that would affect some major Chinese banks, which provide it with energy supplies, other goods, and hard currency. Washington could also play carrots and sticks with its military deployments. In the past several months, the United States has sent massive reinforcements of its air and naval power to the region. It has also agreed to install the Terminal High-Altitude Area Defense, or THAAD, system in South Korea, to loud protests from Beijing and Pyongyang. Some analysts believe that North Korea stepped up its nuclear program in response to THAAD. This may be true. Chinese officials believe that THAAD is aimed at their missiles. This isn’t true, but as long as they think it’s true (despite U.S. assurances, which they have no reason to believe), we might as well exploit that perception for leverage: Tell Xi that we’ll dismantle THAAD if North Korea gets rid of its nuclear program; the offer might give him one more reason to turn up the heat on Kim. Nor would the South Koreans mind if that’s how things worked out. President Park requested the THAAD system reluctantly, only after repeated provocations from the North (increasing her sense of danger) and repeated pressure from Beijing not to install it (stiffening her sense of national pride and independence). The THAAD debate illustrates that missile-defense alone is not a sustainable defense strategy, in any case. The system may work well against one incoming missile, but it’s never been tested against two or more, so the North Koreans (or some other adversary) may calculate that the way to overwhelm the defense is to build—and potentially fire—twice as many offensive missiles as planned. Which leads to the second part of a rational policy toward North Korea: classical nuclear deterrence. The next president should take steps, especially with China, to prevent Pyongyang from deploying a nuclear missile; but if that proves fruitless, he or she should make very clear that North Korea’s use of nuclear weapons—or even a conventional invasion of South Korea (which might be accompanied by a brandishing of nukes to deter anyone from coming to Seoul’s aid)—will be regarded as an attack on the United States and will be dealt with accordingly. There should be no ambiguity about this. Kim Jong-un may be crazy, but his eccentricities have always been in the service of his survival—and he should understand that he’s putting his survival on the line. Daniel Sneider, associate director of Stanford University’s Shorenstein Asia-Pacific Research Center, thinks we should deploy more nuclear-capable aircraft on U.S. bases in Asia to drive this point home fiercely. Finally, an American president should be on the lookout for all genuine diplomatic overtures and take advantage of them. This is what the United States did with the Soviet Union throughout the Cold War, and North Korea is a far less formidable threat than the Soviet Union; it’s not even worthy of being mentioned in the same sentence, except to draw contrasts. After these statements are made and actions taken, the president should move along to other, more important matters. To do otherwise plays into Kim’s game. He wants to set off alarm bells so as to be treated as a major power; that’s the only chip he’s got. It does us no good to play his game; the chip should be assessed for what it’s worth. China is Asia’s genuinely aspiring global power; it needs encouragement, and pressure, to be a responsible one, and its deed to that claim should begin with solving its Kim Jong-un problem.